INTRODUCTION: Traditionally laparoscopic cholecystectomies are done with dissection just in the region of Calot’s triangle. 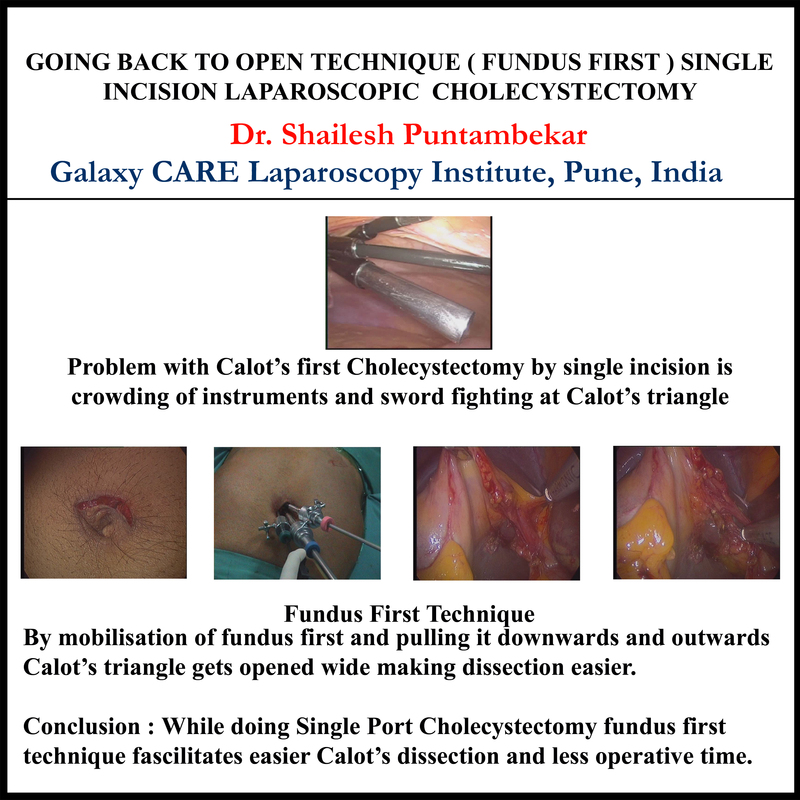 With the advent of single incision laparoscopic cholecystectomies, the Calot’s triangle approach makes the procedure technically difficult to perform. In our seres of single incision laparoscopic cholecystectomies,the fundus first approach made the procedure technically easier and easily reproducible. METHODS AND PROCEDURES: Single incision laparoscopic cholecystectomy was performed in 3 patients with chronic calculus cholecystitis. A single transumblical incision was used and a 10mm port for the scope (0degre 10 mm scope) and two 5mm working ports were placed through it. Routine laparoscopic instruments were used for the surgery. After pneumo-insufflation, a fundus first approach was performed. The gall bladder was dissected out of the fossa till the gall bladder was attached only by the cystic duct and artery. The cystic duct and artery after skeletonization was clipped with vascular endo clips and divided. RESULTS: The median operative time was 25 min. There was no intraoperative, post operative morbidity. CONCLUSION(S): Single incision laparoscopic cholecystectomy can be easily performed byroutine ports and conventional laparoscopic instrumentation.Fundus first approach made the dissection easier. The lateral pull on the gall bladder made the cystic duct and the artery prominent, taking them away from the CBD and the hilar structures, thus making the procedure safer ad technically easier.